As a Scandinavian specialist dealer for over 38 years, I have examined thousands of important and rare Scandinavian stamps and covers and have had the privilege of examining hundreds of significant Scandinavian collections. Starting in 2003, my expert certificates for Scandinavian philately have been publicly available as part of my expertizing and consulting services. My certificates have been widely accepted by collectors, dealers, and auction houses around the world. For many years (and I continue to do so) I have also volunteered my time as an expertizer for the American Philatelic Society (I donate to the APS the cash "fee" they offer me). Over the years I have assisted hundreds of clients and APS members to identify and determine the authenticity and quality of their stamps. Though it seems patronizing to say so, the best time to have your stamps expertized is before you buy them (i.e. while you can still get a refund if there is a problem). In the age of on-line auctions and sellers hiding behind Internet identities and not using their real names, this could not be more important! However, a surprisingly large number of collectors simply don't heed this advice. "Buyer Beware" has never been more true! Protect yourself and stop wasting money on stamps that are not what you think they are. My services can help you do just that. Someday, you or your family will sell your stamp collection. Hopefully that day is far in the future. However, when your collection is sold, a significantly higher price can be obtained if the "key" and "problematic" stamps in your collection already have certificates. When many non-expert dealers buy a collection, they will discount the value of "key" or "problematic" stamps and even assume that they are fake or have hidden problems. [Obviously that is a good reason to instead sell to a dealer who is fully qualified in that specialty.] Even if the dealer does not discount the value, they have to take into account the value of their time and money that will be required to obtain certificates for stamps that need them. If your stamps are sold at auction, the bidders will likely bid less if they know that they will have to go through the "hassle" of getting certificates and payment to you by the auctioneer may also be delayed. All of this can be avoided by obtaining certificates NOW for the "key" and "problematic" stamps in your collection. Not only will you have greater knowledge of and confidence in your collection, but when your collection is sold you or your family will likely receive a significantly higher price. Color Certificates: If you have individual Scandinavian stamps, covers, or other items, for which you need confirmation of their identity and examined for quality, defects, and repairs, you will find my color certificates to be exactly what you are seeking. If you are in the process of purchasing an item and need a quick opinion, you will find my average turnaround time of two weeks to be very helpful. See the full explanation of the service and fees, view a sample certificate, and download a submission form. Quick Opinion Service: There are times when you are considering buying a costly, rare, or problematic stamp and you would at least like to know if the stamp has any obvious problems that an expert might notice but you are not aware of. Knowing that a stamp does have problems or is an obvious forgery can save you from wasting a lot of valuable time, money, and energy. This service is designed for that kind of situation. This is not a substitute for expertizing, but it is a pre-purchase "filter" to avoid at least some stamps that are not as described. In these days of on-line auctions and sellers hiding behind Internet IDs and not using their real names, such caution has never been more important. Read more about how you can protect yourself. Collection Review Service: As a dealer, many of the stamp collections I purchase contain misidentified stamps or stamps with defects or other quality problems of which the owner was not aware. For many years I have privately offered a "collection review" service in which clients send album pages from their collections to me for review of identification and examination of quality. This service is now publicly available and can even be free in some circumstances. Consulting: Many collectors have questions about their stamps and collections. For example, "how can I build this specialized collection to the next level?" Or, sometimes more specifically... "is this type of postmark typical for this stamp" or "how does one identify stamps of this issue?" Additionally, most collectors also have questions about the value of their stamps: "what affect on value does this [defect, postmark, centering] have on my stamp?" I am happy to answer such queries either individually or as part of a broader examination of individual stamps or an entire collection. Lastly, when a collector is building a significant specialized collection, it is helpful to seek advice and counsel about how to proceed, what to include, what not to include, etc. I welcome such inquiries. You will receive a color-illustrated certificate clearly identifying and describing the item, with a statement regarding authenticity, condition (mint hinged, mint never hinged, used, etc. ), and quality, with notations of any defects, repairs, or other problems. Identification is made using the Scott Catalog and the appropriate specialized Catalogs (Facit, NK, AFA, Norma, etc.). Here is an illustration of a sample certificate. I endeavor to maintain an average turnaround time of two weeks or less. Most certificates are issued only for individual stamps, covers, blocks, etc. In certain cases it may be possible to obtain a single certificate for a set or group of items, at an additional charge. This is not recommended for items that you plan to sell. Submissions will not be signed, marked, encapsulated, or altered in any way. The return will be wrapped in plastic and packaged with stiff cardboard for protection in the mails (as should be your submission). Specific questions, requests for additional information, or opinions regarding value, shall be answered when possible, though there may be a small additional charge. Please state any questions clearly and concisely. In any event, please include your email address for speedier service in case I have a question for you. Prior to submission, used stamps or mint stamps without gum should be thoroughly cleaned (soaked), if it is safe and appropriate to do so, of any hinges, paper remnants, or other adhesions. Items not properly prepared may result in being returned without a certificate and with an administrative fee charged. Additional fees may apply to very high value items, items requiring extensive research or consultation with other experts, or for the answering of related questions, opinion of value, etc. Items for which no current catalog value is available will incur fees based on my estimate of their market value. 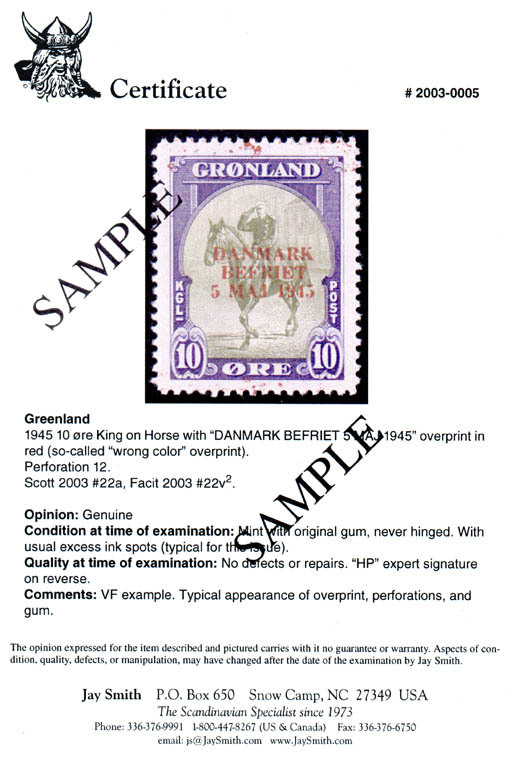 Forgeries, counterfeits, bogus stamps, etc., and low-value stamps obviously incorrectly identified, are subject to a minimum fee of $15 for the first item and $10 minimum each for additional items in the same sending (plus return shipping charge) if the owner has explicitly requested that no certificate be issued in such a case. If I am not able to render an opinion and thus a certificate is not issued, there will be only a $10 administrative charge, plus the cost of return shipping. Value $3000 or more, mailed*** to U.S. address: $24.00 minimum, additional cost depending upon value. Other mail services, heavy items, etc., may have additional charges. ** Sent by Certified Mail, with private philatelic insurance. *** Sent by Registered Mail, with primary postal insurance (no limit) and backup private philatelic insurance (limit $25,000). **** Sent by Registered Mail; insurance only available in certain cases. Please confirm situation before submitting items. Express Mail (highly recommended, and sometimes required, for shipments to other countries) also available at additional cost. Customs paperwork and costs for entry into country of destination is the responsibility of the submitter. Shipment of items to me is done at the submitter's risk while in transit. While in my custody, items are covered by my philatelic insurance. Shipment of items back to the submitter is insured per the information in the Return Shipping Charges section; the insurance coverage is based by the insurance company or post office upon the opinion I have rendered, not upon the submitter's original identification. While I will endeavor to best represent the submitter's interests in insurance matters, the insurance company or post office shall make the final decision regarding value of and payment of claims for lost items and I shall have no responsibility for any such decision. When sending items TO the U.S. from other countries, please be aware that the U.S. Postal Service currently places incoming foreign Registered Mail in the normal mailstream and does not offer any special security for such mail, though a signature is required upon receipt. I highly recommend that items being sent TO me from other countries be sent by Express Mail which offers much more security and better tracking. All fees and charges are in U.S. Dollars. Advance payment is required. Because of the possible variability of fees, I highly recommend payment be made using MasterCard or Visa. Credit card information may be submitted accompanying the submission(s) or via the Internet to my secure web site at https://secure.JaySmith.com. If you do not use a MasterCard or Visa, payment may be made by check or money order in U.S. Dollars, or by cash (at sender's risk) in U.S. Dollars, Euros, Swedish Kroner, Danish Kroner, or Norwegian Kroner. Additionally payment may be made with full gum U.S. (inquire for percentage of face value, dependent upon type of postage). If you are not using a credit card for payment, you will receive much faster return of your submissions if you pay in excess of the anticipated fees and charges. In such cases, please clearly instruct me as to whether the excess should be refunded in U.S. Dollars (check in the U.S.) or be kept on account for future submissions. Clients expecting to make regular submissions may establish an account by pre-paying at least $100. Additional pre-payments to "refill" the account will be requested as necessary. There are many times when one is considering buying a stamp that is known to be often forged, altered, repaired, etc., or a stamp that is often misidentified or misrepresented. At those times, it is extremely helpful to get a quick opinion of whether the stamp is obviously NOT as identified. Just think of how much of your valuable time, money, and energy you could avoid wasting if you knew before bidding/buying that a stamp was a forgery or was reperforated! My Quick Opinion service is exactly what you need for such situations. This service, for Scandinavian items only, uses your emailed scan or a link to an image on the Internet, to attempt to give you some guidance about the item. This service can ONLY TELL YOU IF AN ITEM IS OBVIOUSLY NOT AS DESCRIBED. This service CANNOT POSITIVELY CONFIRM that an item is genuine or its quality. For positive confirmation of authenticity or quality, you need my expertizing service. UNDER NO CIRCUMSTANCES SHOULD A QUICK OPINION BE CONSIDERED A FINAL OPINION; THAT CAN ONLY BE RENDERED AFTER AN EXPERTIZING EXAMINATION. I am not able to give any opinion of value based on seeing an image; please keep in mind that I have not personally examined the item thus do not know its true quality and the seller is, by definition, a competitor of mine. THIS SERVICE ONLY PROVIDES MY OPINION AND IS NOT GUARANTEED IN ANY MANNER. I ACCEPT NO LIABILITY FOR ERRORS OR OMISSIONS. At this pricing, this service is only available via the Internet (email, scans, linked images, etc.). Despite the limitation that this service does not eliminate the need for proper expertizing, it can save you an enormous amount of time and money. The low fee structure is designed for a quick look at an image(s) and a quick reply; the fee does NOT cover phone calls, extensive discussion / communication (that email sometimes degrades into), and does NOT include extensive research, etc. I am NOT able to reply by phone or discuss by phone items submitted under this service. More comprehensive services are available at additional cost. If I am unable, for any reason, to comment at all about the item, there will be no fee charged. My goal is to reply within 24-48 hours (24 hours when I can; including weekends and holidays), however, THERE IS *NO* GUARANTEE THAT I WILL BE ABLE TO RESPOND IN A TIMELY MANNER; I am usually only away from the office a few times per year, but you must not rely on my being available to reply quickly every time, in case I am traveling or otherwise unavailable. I also reserve the right not to comment on any item, for any reason. Despite my 24-48 hour goal, if an auction is closing soon, you must be prepared to act (or not) without my reply. If an auction closes or an item sells before you receive my reply, you may email to cancel your request, but, to avoid a fee, I must receive your cancellation before I reply with my opinion. Item appears to be a known forgery. Item appears to have obvious [defects, repairs, reperforation]. Item may not be as described, it looks like [Scott #11, not #11b]. Item image does not show obvious (to me) problems. Item image does not show obvious (to me) problems, but the item is one which often has [problems, repairs, forgeries] and a proper expertizing examination must be done to protect yourself and your investment. IN *NO* CASE CAN I POSITIVELY STATE THAT THE ITEM IS GENUINE OR THAT IT DOES NOT HAVE QUALITY PROBLEMS. I can only tell you if the item is obviously not genuine or if it has obvious (to me) quality problems. This service does not replace the need to obtain a proper certificate (if appropriate) once you have acquired the item. Images: The better the image quality, the more information and more accurate information I am able to provide to you. Always scan at full size. The best type of file is TIFF (.tif) format at 300 dpi. This results in very large image files, but also much more detail. The second best is JPEG (.jpg) at 300 dpi with the least amount of compression (highest quality setting). Lower resolution (dpi) will result in smaller file size, but it will also be of less quality, though is often still acceptable. Depending upon the scanning software you are using and your level of experience, you may have (or think you have) more or less control over these settings. Do the best you can. DO NOT EMBED THE IMAGES IN ANY OTHER TYPE OF DOCUMENT -- not a Word document, not a PDF document, etc. I need a raw image file ending with .tif or .jpg. Sending images embedded in documents may result in additional cost and/or inability to give you an opinion. If you start your scanning process in a program like Acrobat or Word, you are not going to end up with an IMAGE file (you will end up with a PDF or Word file that contains an image). Start your scanning process either using an image editing program or the scanning program that came with the scanner. When sending multiple images, before attaching them, check the file size of the images you are sending. It is best to keep the total size of the files, in a single email, under 5 MB (5,000,000) if you can. My system does not have a limit, but your email provider might. It is fine to send multiple emails but please number them 1 of 3, 2 of 3, 3 of 3, etc. so I will know for sure that I got them all. Tell me what the item is advertised to be. Requests of "what is this" are accepted, but there may be an additional charge. Tell me initially of any specific additional questions you have. Follow-up questions / communication will incur further cost. Fee Structure: Each stamp, block, cover, etc., will be counted as an item. Assume that the stamps in sets of more than one stamp will be counted as individual stamps/items, however, in some cases, I may choose to count them only as a single item or as less than the full quantity of items. The Base Fee and the Per-Item Fee for multiple items are calculated on items submitted at the same time (multiple emails okay if needed due to size of images), on the same day, and receiving a response all in the same reply. Assume that "Oh also what about this...", sent the next day, will incur a new Base Fee even if you have not yet received a reply to the initial message. If my Quick Opinion service seems too limited for your needs, you are welcome to submit items for expertization or to contact me regarding consulting services. Have you wondered if you have the Norwegian Posthorn issues sorted out correctly? Do the Finnish Serpentines puzzle you? Are you concerned that you might have purchased some stamps with hidden flaws? Would you like to upgrade the quality of your collection, but are not sure for which stamp issues this is a reasonable possibility? You are certainly not alone in these types of concerns! Many collectors find themselves with questions or concerns about the identification and quality of the stamps in their collection. My Collection Review Service is intended to assist you with these broad questions about your collection. When you send part or all of your collection for review, I will verify the identification of the stamps and look for possible quality problems. (Send the stamps on the album pages if you want the stamps identified for your album!) In the case of individual stamps that typically need expertization, I will advise you of that fact; the review is not a substitute for expertization. Your stamps will be sorted out correctly and I will report with answers to any questions you may have or with suggestions as to any stamps that are likely candidates for upgrading. Additionally, you may request as part of the review, an appraisal for insurance or estate planning purposes. The fee for the Collection Review Service is based on the amount of time involved. The minimum fee is $50, plus return shipping costs. If an appraisal is requested, the fee will likely be higher and is based on the amount of time required. Clients actively purchasing similar types of stamps from me may be eligible for a FREE collection review. Please inquire. Are you considering expanding your collection into a new specialized area and are seeking advice? Have you been offered a "significant philatelic property" but are not sure if it fits your collecting goals? Do you feel that you are at a dead end with your collection and you are looking for ideas of how you can continue to build it? Do you have specific questions about aspects of one or more stamps or parts of your collection? Do you wonder about the effect upon value that a [defect, postmark, centering] have on a stamp?. I am happy to answer such queries either individually or as part of a broader examination of individual stamps or an entire collection. When a collector is building a significant specialized collection, it is helpful to seek advice and counsel about how to proceed, what to include, what not to include, etc. I welcome such inquiries. Consulting services are available for a fee and are based upon the amount of time required. In many cases, these issues cross-over with Expertization and/or Collection Review. The lowest appropriate fee will be charged. Generally speaking, the minimum fee is $10 to cover the administrative costs. Clients actively purchasing similar types of stamps from me are generally eligible for FREE consultations whenever desired. Please inquire. You may download the submission form in PDF format or you may email to request that forms (specify how many) be sent to you by postal mail. Click here to download the Certificate Submission Form in Acrobat PDF format. Note: It is best to RIGHT CLICK the link ABOVE and select the option that is labeled something like "Save Target As" or "Save Link As". This will save the PDF file on your hard disk so that you may use Adobe Acrobat to print out a copy whenever you want one. Adobe Acrobat Reader is available free from http://www.adobe.com/products/acrobat/readstep2.html (will open in a new window or tab). An actual certificate would also be embossed with a seal, signed in pen, and dated.